The Tradesman is exceptional value for building and construction, and for home and lifestyle. 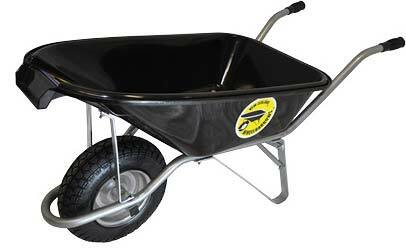 All the benefits of the Tradesman wheelbarrow, but with a puncture-proof wheel. The Tradesman has been the premium wheelbarrow of the construction industry for decades and maintains the design that earned that legacy. The tray is now produced with recessed bolts, along with other improvements, but it stays true to the original design and values that exemplified the passion of Douglas Davidson when he founded New Zealand Wheelbarrows over twenty years ago. The Tradesman tray exceeds our highest drop test standard for plastic trays. Recessed bolts, so your load won’t snag on them. Impact resistance factor of 25. Very strong and stable frame. Heavy duty hot-dip galvanised frame.